DAWSONVILLE, Ga. – On Sept. 11, 2001, nearly 3,000 people died when terrorists hijacked four commercial planes and crashed them into the twin towers of the World Trade Center in New York City, the Pentagon in Washington D.C. and an open field in Pennsylvania. On Tuesday, the 17th anniversary of the horrific terrorist attack, people all across the United States from crowded metropolitan areas and to tiny farming communities gathered to commemorate Patriots Day in remembrance of the lives lost that day. Dawson County residents, firefighters, emergency service personnel, law enforcement, veterans and students gathered at Fire Station No. 1 for a solemn and very moving ceremony. 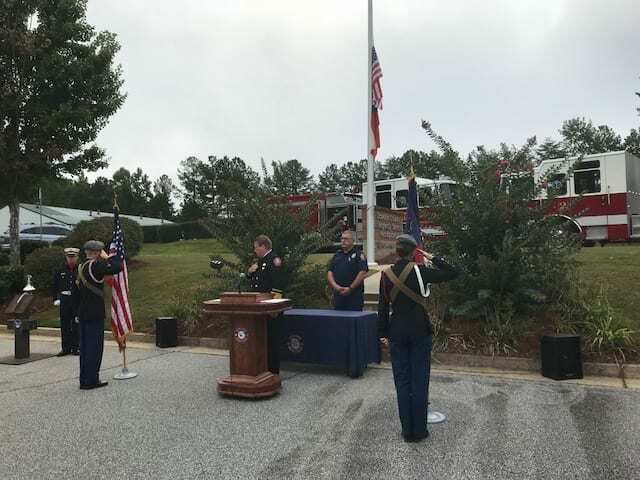 Dawson County Emergency Services Director Danny Thompson played the radio transmission to first responders that went out the moment American Airlines Flight 11 struck the North Tower. Within minutes the call for every available ambulance to report to the World Trade Center was issued. The Dawson County High School JROTC presented the colors and the choral group from Dawson County High School performed. Firefighter-Paramedic James Rutmann played a moving rendition of Amazing Grace on the bagpipes.